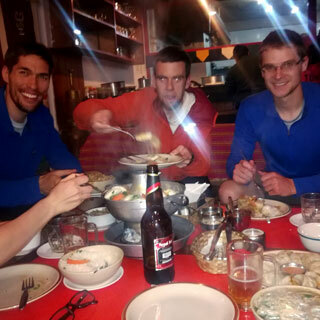 Join our life changing Manaslu Trek with carefully planned itinerary and inclusive tour price with complete services including local guide, permit and all the necessities for the year 2019 and 2020. 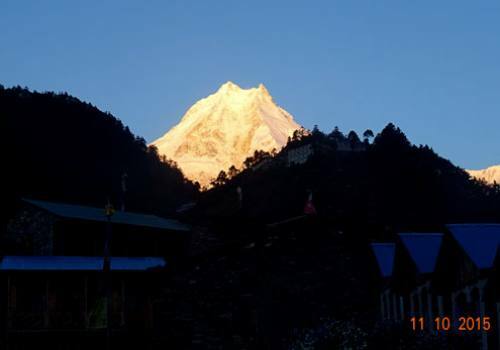 The journey of Manaslu Circuit Trek starts from Soti Khola at the altitude of 700 meters from seas level, is a charming village at the bank of Budhi Gandaki river. From lush rice paddies terraced fields with water buffalo and thatched huts, we walk north along the incredible, mountain-capped high route, through sprawling Gurung villages perched on high, terraced hilltops covered in Rhododendron, to reach Kutang, or lower Nubri. 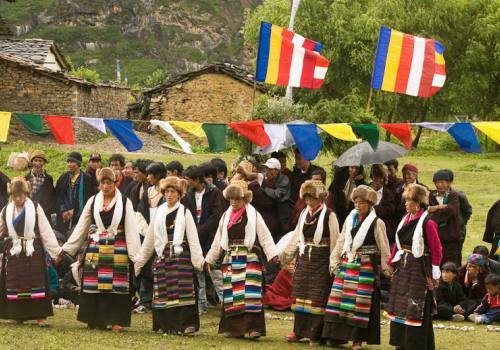 Here the ethnically Tibetan inhabitants speak their own dialect, partly Tibetan and partly Gurung, and live a lifestyle that spans Nepal and Tibet. Trekking to Manaslu Circuit is ever higher to upper Nubri, purely Tibetan culture and tradition; we share the trails with yak caravans. Here, trade with Tibet continues as it has for centuries and Tibetan villages have been forged from the wilderness by Tibetan refugees. 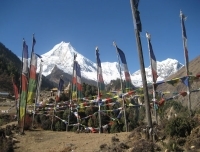 Inspiring mountain panoramas, dominated by Manaslu itself, are a highlight of the trek as are day hike to Pun Gyen Gompa, Manaslu Base Camp from Sama Gaun and Rui La, a traditional trade route to Tibet at the Nepal-Tibet boarder from Samdo Village, the valley above Samdo near the border of Tibet and the epic crossing the snow-covered Manaslu Larke Pass to Bimtang and Manang region of the Annapurna circuit is life time experiences. 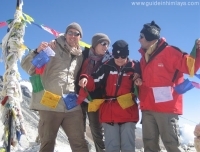 This rapid Manaslu Circuit Trek program is planned for those fit and strong people already acclimatized in the Alps or Himalaya with previous trekking experience that allows to experience marvelous Manaslu region in short period of time. If you are looking for relaxing and leisure Manaslu trek we recommend you to chose our 18 days around Manaslu trek program that allows to have proper acclimatization process and trek without rush or Manaslu Trek via Tsum Valley that requires minimum 21 days to complete the trek. Early morning, drive to Arughat, some 7 hours by bus or a private jeep through the beautiful landscape. After getting at Arughat we have a connecting local bus ride to Soti Khola, at the bank of Budhi Gandaki River. Overnight in trekking lodge. Meals included: Breakfast, Lunch and Dinner. The trek starts by following the Bhuri Gandaki River through the shady sal forest, continuing steeply uphill along a rugged Cliffside. From here you can see the river’s white and wild rapids below. Eventually the trail drops to the Gurung village of Labubesi and follows along the riverbank until we reach the village of Machha Khola where we will spend the night. Meals included: Breakfast, Lunch and Dinner. Day 03:Trek to Jagat (1340m). Today; we follow the gorge and continue up the river. Langur monkeys can usually be heard playing in the jungle high above, where there are also larger Garung villages. We trek through the villages of Khorlabesi, Tatopani, Dovan, Thulo Dunga and finally the cultural village of Jagat at the elevation of 1340m. Now I can see the first Tibetan Buddhist culture influenced village in Manaslu trail. Overnight in Jagat. Meals included: Breakfast, Lunch and Dinner. After spending the night in Jagat the trail begins to climb a rocky ridge where views of Sringi Himal (7,187m) emerge. Continue through rich terraced fields of maize, potato and millet before entering the Nupri (‘the Western Mountains) via bamboo forests. We spend the night in the Buddhist village of Deng for overnight stay. Meals included: Breakfast, Lunch and Dinner. From Deng, pass by numerous Tibetan mani walls (intricately hand carved stone walls with Buddhist scriptures), weaving in and out of canyons. Enter into a colourful forest of firs, oaks and rhododendrons before arriving in the settlement of Namrung for overnight stay. Meals included: Breakfast, Lunch and Dinner. Continuing from Namrung the trek climbs steadily into the alpine where you’ll see a first stunning glimpse of Manaslu North and Manaslu. From this point on many of the locals dress in traditional Tibetan clothing called chubas. Still keep going to Sama Gaun through the villages of Shyo, Lho and Shyala. This will be a long day of 7-8 hours walk. Overnight in Sama Gaun Meals included: Breakfast, Lunch and Dinner. Rest days to get physically acclimatized. 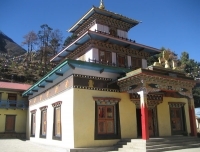 We can spend the day exploring surroundings such as, Birendra Taal (lake), Buddhist monasteries, Samagaun, a big Tibetan cultured community and a side trip to Pun Gyen Gompa or Manaslu Base Camp but this both side trips requires almost a full day for each. 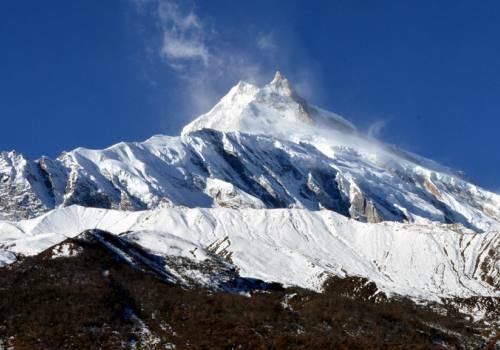 We will see a marvelous view of Manaslu. Stay overnight at same place. Meals included: Breakfast, Lunch and Dinner. 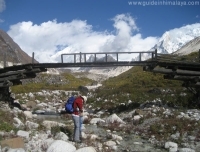 Day 08: Trek to Samdo (3860m). This is short day to allow you to better adjust to the altitude. Here is a land of yaks, plentiful marmots and pastures where only barley and potatoes can grow (due the high elevation) and where we finally depart to above the tree line. A pleasant walk brings us to the picturesque village of Samdo –a town known for its yak herding. Samdo is also at the convergence of 3 valleys and is only a day’s walk from Tibet. You are quite likely to see traders coming from the valley carrying Chinese and Tibetan goods. Stay overnight at Samdo. Meals included: Breakfast, Lunch and Dinner. Day 09:Trek to Larke Rest home aka Dharmasaala (4460m). Continuing on from Samdo follow along a wide, broad path, crossing the Bhuri Gandaki River and traversing along a mani wall. Continue climbing over the Larkya Glacier until coming to a ridge which offers grand views of a huge gorge. We will spend the night here, before embarking on the high Larkya La the next morning. Overnight at Dharmasaala. Meals included: Breakfast, Lunch and Dinner. Day 10: Trek to Bimtang (3750m) via Larke Pass (5160m). Today; it is demanding walk, though not technically difficult trek over the Larkya La at a breathtaking 5160m. From Larkya Phedi, cross glacial moraine and past four frozen lakes as you make your way to the pass. It takes approximately 5 hours to reach this point. From here you can see incredible views of Himlung Himal (7,126m), Cheo Himal (6,820m), Gyaji Kung (7,030m), Kang Guru (6,981m) and Annapurna II (7937). Begin your descent down a trail along a steep gully. Eventually the trail peters out into more level area of grassy moraine. The valley opens up as you continue your descent to Bimthang and we’ll overnight here. Meals included: Breakfast, Lunch and Dinner. 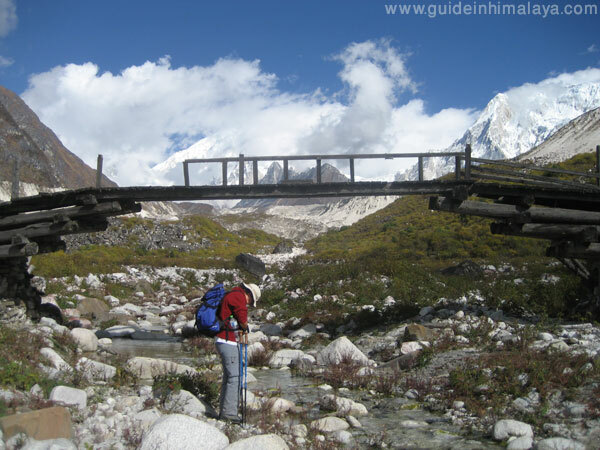 Cross a glacial stream and climb over the side of the moraine descending into a spectacular forest of rhododendron and impressive pines, with view of Manaslu providing an equal amount of splendor. Descend down towards the Dudh (milk) Khola then continue through a more agricultural landscape until reaching the village of Goa, Tilje and finally down to Dharapani. Meals included: Breakfast, Lunch and Dinner. After our breakfast we will catch a local jeep or bus get a bus to Beshisahar and connecting local hiace van drive to Kathmandu. This is will be a long day drive. Considering to extend a night and stay overnight in Besi Sahar allows you to travel relaxingly to Kathmandu. Transfer to hotel in Kathmandu. Overnight in Kathmandu. Meals included: Breakfast, Lunch and Dinner. One government registered local friendly trekking guide. An assistant guide if group size exceed more than 6 people. 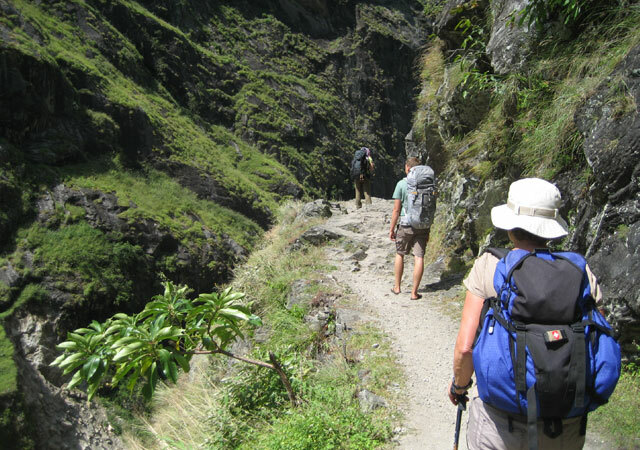 One sharing porter between two trekkers to carry your main pack (weight limit 20 kg). All ground local transportation, group first aid kit and water purifier. Sharing twin/double bed room accommodation in trekking lodges during the trek. 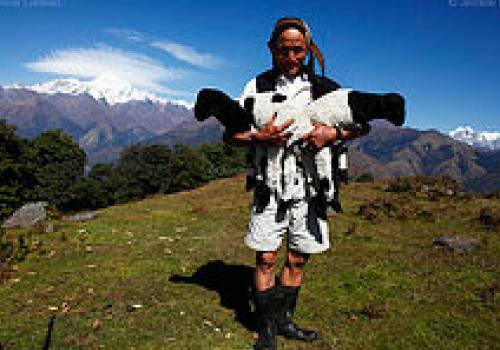 Food, accommodation, salary of the guide and porters. 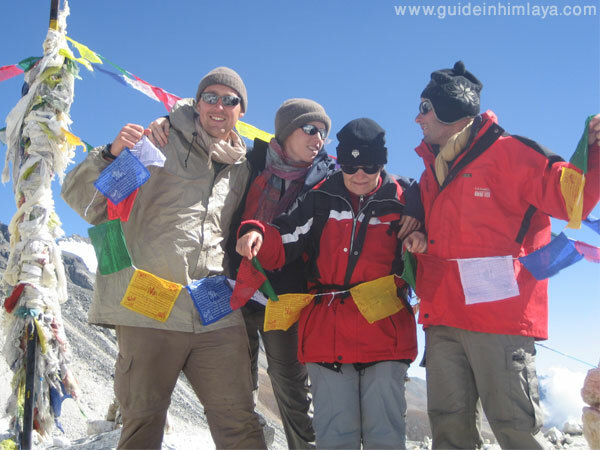 All necessary Manaslu Trekking Permits. All bar bills and beverages such as coke, fanta, mineral water and laundry service. Hot shower, hot water, internet and phone calls. Toiletries and personal nature expenses. Personal travel insurance and equipment. 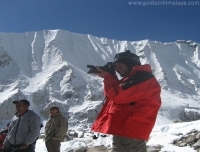 While searching local trekking agency in Nepal for Manaslu trek; I found Pradip online and he was quick to respond and answered all our questions. 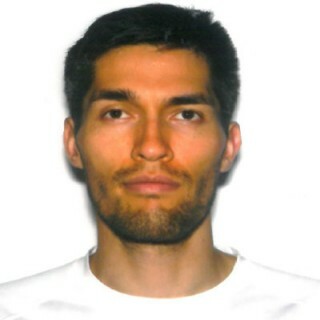 His English was very good which helped a lot to plan our trip. He worked with me to set up a trek which met our compressed schedule. He provided us with a guide who had hiked the circuit many times and spoke some English. Amazing trek 10/10, very glad we selected this trek. It was an absolutely wonderful life time experience. Pradip as our guide is great and very enthusiastic and informative. 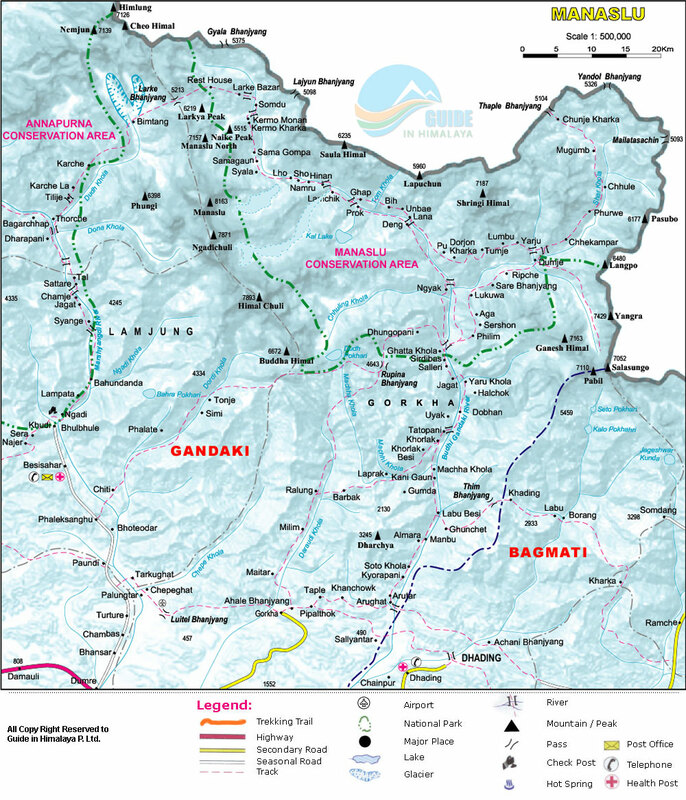 I trekked ‘Mystique Manaslu Trail Trekking’ with my mom, cousin sister and her husband. We booked our trip with Pradip Tamang, An independent trekking guide. He made our trip special and remarkable. It was my seventh visit to Nepal and I never get enough of travelling to Nepal and hiking Himalayas, Shangri-La, a country of ultimate destination. Definitely, I will come back soon and do some more trekking in Nepal. Note: This trip can be personalized as per your requirements that meet your time frame. The trip price will be according to Deluxe, Standard, Budget and group size so please kindly provide us your details for tailor made program. .
Daily walking hours: 5-7 Hours.